Gympie Regional Council has no objection to the artwork on the Rainbow Beach stairs. 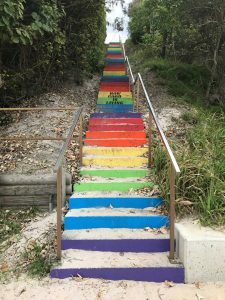 It is unfortunate the issue has not been able to be resolved between Team Rainbow who painted the rainbow on the stairs, and the former Rainbow Beach resident who placed the words ‘how good is living’. Team Rainbow requested the wording to be removed from their art installation as permission from the artist was not sought. Council has offered a number of alternative locations for the wording ‘how good is living’ to support the former resident and the important mental health message. Neither party sought council approval for the artwork, however council is happy for it to remain and work with the artists to ensure the art is maintained. A new business on the coast! Best winter beach in Australia!